As our purge comes to a close, I feel it has not only made our home feel good and look good, but also has helped our minds be uncluttered as well. The way society is nowadays, we have taken the "more is better" approach to things. I still love the saying that "less is more," at least when it comes to stuff that is. When we fill our homes with too much of things that are not needed, or we have so much of already, it can be hard to keep it in order. 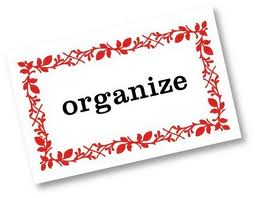 I have found that organizing your home and then keeping your home organized in a way that works for your family is best to also help keep our minds organized. Sometimes I feel that stuff can take over other things of great importance. Focusing on my personal beliefs and values are of great importance to me, along with what is important for my family's daily endeavors. If my mind is consumed with worrying about what to do with our stuff, then by all means my family and I have a huge problem and it will be hard to stay in order. One thing for sure is my husband has never had an issue with stuff. Lucky for him. My kids and I did, in a sense of not wanting to get rid of, or throw things away. I sure don't anymore. If it is going to become junk, or we will not have use for it months down the road, out it goes. My children have gotten better with toys as well. We do not need more of the same type of stuff just to have more, because it will become clutter. I have found that they are alright with bringing new stuff in and getting rid of something in its place with not much problem at all. It used to be a bad battle that I was sure to lose every time. I found what hobbies are important for me and am sticking with just those so I will only have stuff pertaining to those hobbies. When our home feels free, our minds should fell free. More time do other things, not worried about a bunch of stuff. There is nothing wrong with bringing home new things at all. We do bring home new items here and there, but I know exactly what I will use it for and where it can be placed in our home. Therefore, we have room for it. The point for me is I have created and organized all of these spaces in our home, and therefore if it can be stored nicely then we can have it, if not, then something needs be taken out or reconsidered is all. We homeschool, enjoy to read and many other things, so we will have the need and/or want to bring more things home. Again, this is alright! It is just very crucial for me to know what is coming and going out of our home to keep track of our stuff and our minds. After all, I am a gal who loves stuff. I've just made the space to keep these things in order! Not hard at all, once you have the mindset!